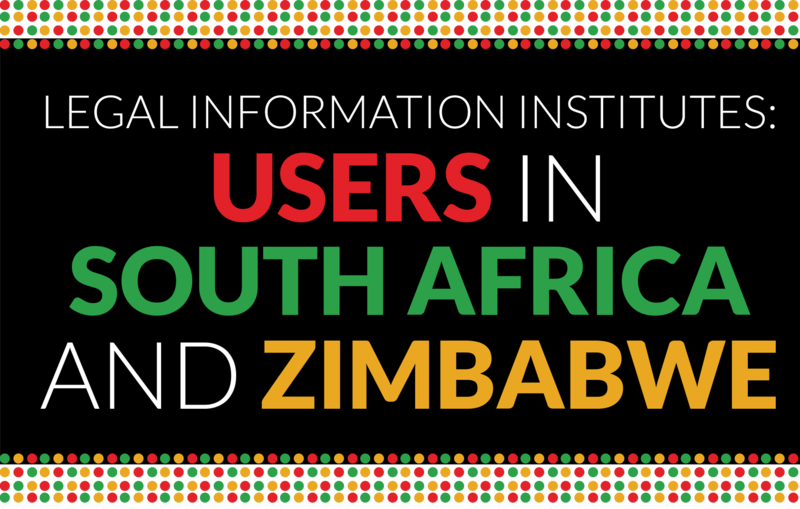 The report to the LII User Study provides clear evidence of the positive impact of the LIIs on the judiciary, lawyers, students and communities in South Africa and Zimbabwe, in urban as well as rural areas. The Southern African Institute for Policy and Research recently completed a report titled: Ethnographic Research on the Impact of Legal Information Institutes in Zimbabwe and South Africa. The report was launched at the Open Law Africa 2018 workshop, held at the Crowne Plaza, Rosebank, South Africa. Representatives of the African LIIs at the workshop approved the recommendations of the report and agreed to an implementation strategy. The report was commissioned by the Open Society Foundations, following an evaluation that advised AfricanLII to provide more evidence of the impact of the LIIs on society, and thus to improve its fundraising capabilities. The evidence was collected by way of an ethnographic study in two countries that host prominent and relatively established LIIs, namely South Africa and Zimbabwe. The LIIs in these countries have been in existence over a long period of time and their impact can, therefore, realistically be measured in terms of regional impact, trends and needs. The outcome of this research will also form part of the thinking for a new strategic plan guiding the future development of AfricanLII umbrella programme, and the African LIIs. To measure the impact of access to legal information on the practice of the law and the rule of law, by providing practical evidence of such impact from different regions in two different African countries. The research focused especially on organizations and institutions with the widest impact on the justice sector in South Africa and Zimbabwe. One such institution is that of the Magistracy. Magistrates are based in both urban and rural areas and handle the majority of the caseload of a country’s justice system. LIIs are also used by civil society organizations who work with and for communities to enable them to effectively access justice. LIIs are also used by paralegals, who with the support of civil society, give legal assistance to the most marginalized members of society, including those living in rural areas. This report provides clear evidence of the positive impact of the LIIs on the judiciary, lawyers, students and communities in South Africa and Zimbabwe, in urban as well as rural areas. While the cases are available on the LIIs, they are not always up to date and the collections are at times incomplete. There is also limited access to consolidated and subsidiary legislation, international treaties and information on their domestic application. The fact remains that where the law is not known, it cannot be effectively applied. There is an urgent need to start placing online important judgments from the Magistrates’ Courts. Summaries and classifications of important judgments will help citizens understand important law, as well as help lawyers and NGOs become more efficient at legal research. There is also a need for a subject index which would enable more efficient searches of case law. Further enhancements to offline versions of the Legal Information Institutes (such as Pocket Law) would be useful for all categories of users in order to mitigate against issues of Internet accessibility and high costs of data. LIIs could partner with news organizations to live stream court proceedings. Audiovisual aids would also create significant benefit for visually-impaired users. The LIIs should use social media to communicate with its users, linking to relevant information on the LII website or news articles. It can also be used as an advocacy tool with which to engage users and provide a platform on which to participate in public debates. The findings of this report will be distributed to potential donors in the form of a brochure, with a link to the full report on AfricanLII’s website.